Departing from Your Hotel, Clérigos, or Cais de Gaia, you will discover on the Douro’s left bank, the best view of Porto on board of our electric Tuks and will visit the traditional fishermen village of São Pedro da Afurada. Embark on Marina of Douro in hybrid boats for a wonderful 2-hour ride along the Douro, during which you will degust an excellent port wine. In the back, is waiting for you a dinner at the restaurant of the fishermen village, where you will be able to appreciate shellfish, grilled fish or local specialties. Warmth, authenticity, quality in the host, are the main features of the restaurant. At the end of dinner, our Tuks will take you in a visit to the historic center, under the city lights, accompanied by our guide. 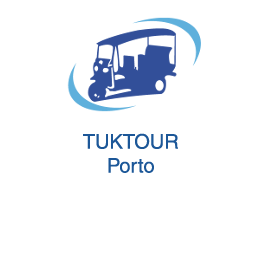 Degust, Discover, Share, Enjoy the Tuktour Porto.